The Stars scored two goals off turnovers as Cristopher Nilstorp shut the door on 27 Rampage shots for a 2-0 win tonight in Cedar Park. Reilly Smith was key in generating both Texas goals, collecting San Antonio turnovers deep in their end and generating the two Texas goals. "At the start of the year, we were missing those [opportunities]," said Coach Desjardins. "When you're on a roll, things seem to go your way." In the first period, both teams seemed to have trouble getting things started and all on the same page. "We have played well [on the road]. It's tough to travel," said Coach Desjardins. "I didn't think we were quite as good tonight as we did on the road. San Antonio didn't give us a lot tonight." "We probably didn't play our best game tonight, but we got two points," added Reilly Smith. Texas scored the only goal of the first period in the fifth minute. After a dump-in, Alex Chiasson pressured Nolan Yonkman, forcing the Rampage captain to rim the puck around the boards. Waiting on the half-wall was Reilly Smith. Smith drove the crease and backhanded the puck cleanly over Jacob Markstrom's left shoulder for the 1-0 lead. "I was fortunate to get one on net there," said Smith. "It might have tipped off Chiasson, but who knows?" The Stars had a power play in the first but came up short. Tomas Vincour had the best chance of the man advantage, ringing one off the crossbar. Shots were a low 7-6, favoring Texas. San Antonio took a turn on the power play themselves in the second period, also coming up zeroes. The Rampage had more quality chances on Nilstorp as the period wore on, but nothing got through. As the third period began, Markstrom laid a ill-advised pass along the right half-wall. Reilly Smith was there again to pick up the turnover and dish it to Alex Chiasson in the slot. Chiasson got Markstrom five hold before the goalie got set for the 2-0 lead. "The ice was kind of bad tonight and they were trying to work a quick transition game. They had a lot of success with it in the third period." Shortly thereafter, Texas found itself on a 5-on-3 for a full two minutes after Antoine Roussel tapped the puck to the net after the play was already called dead for the original penalty to Wathier. "Nilstorp stood on his head and we had a couple of great clears from Eakin. That really changes the momentum," said Smith. Texas killed all 120 seconds to the great glee of the home crowd. The Stars capped off the night with 6'7" Jamie Oleksiak's first professional fight. Oleksiak bodychecked San Antonio's leading scorer, Jon Rheault. Alex Petrovic took exception and dropped the gloves, which ended up being a big mistake. Petrovic barely got a word in edgewise as Oleksiak worked the body and the head in equal measure, scoring a knockout punch with the right as Petrovic went down. After the game, Oleksiak was complimentary to his opponent, "Petrovic stepped up for his teammate and kudos to Petro for that. It takes a lot of courage." Coach Desjardins added, "It's going to give [Oleksiak] some confidence and I know all the players on our bench appreciated it." Cristopher Nilstorp stopped 16 Rampage shots in the final period to seal the win and his third shutout of the year. The Stars have points in seven straight games and are now six games above .500. Texas stays in sixth place, however, despite the win. 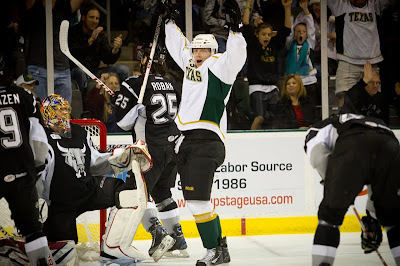 Texas will face off against the Oklahoma City Barons in Oklahoma on Friday and Saturday.